The Remainer-dominated government and Parliament have offered so many false choices called “Brexit” that most people are spun around until they can’t tell if Remain is really Brexit or white is black. Yet she frittered away her objective by accepting whatever the EU demanded, until in November 2018 she came back from Brussels with a bad deal. She called it a Withdrawal Agreement, but it wasn’t a withdrawal agreement, because it would keep Britain in the EU to all practical purposes, after the nominal separation date (29 March 2019), with no deal for the hereafter. Yet she called it a “deal”, so she offered a false choice between her fake “deal” and “no deal.” No other choices existed, she said. She said that her fake deal was the only possible offer from the EU, so she refused to re-negotiate anything. She couldn’t bring herself to motion her fake deal again until March, when her fake deal was voted down a second time (13 March) and a third (29 March). In that period, she blamed Parliament’s “indecisiveness.” Parliament decisively rejected a bad deal three times, yet she called Parliament indecisive! The problem was her bad deal. She, the Remainer, was sticking with a fake “Withdrawal Agreement” that kept Britain in the EU for all practical purposes, without membership rights, for at least 21 months, and indefinitely, because she had agreed to let the EU have a veto on when the Withdrawal Agreement could end, and to let the EU keep Northern Ireland if Britain left without a deal. Her solution? She didn’t abandon her fake deal or seek a better deal or leave without a deal. She suddenly raised the option of extension/delay, even though she had promised more than 100 times that we would leave the EU on 29 March 2019, with or without a deal. So she agreed an extension with the EU from 29 March to 12 April (or 22 May if her fake deal were to be approved by Parliament, but it wasn’t). Her false choice was still: her fake deal or no Brexit. As of this week, May’s latest false choice is between a second extension and no Brexit. She wants a second extension only to re-motion her awful fake deal a fourth time, which is to say, she doesn’t want a second extension to re-negotiate a better deal. No, the same false choice remains: May’s fake deal or no Brexit. The European Council President (Donald Tusk) is colluding. He is now talking about an extension up to 12 months, lasting as long as it takes to get her fake deal approved. He didn’t put it as accurately as I did: Tusk spun it as a “flexible extension.” May’s Attorney General (Geoffrey Cox) has corroborated an extension of months. The same false choice remains: May’s fake deal; or no Brexit. She’s just got more time to re-motion it. Now, “compromises” have been the false choices offered by Parliamentary Remainers for the years: they offer one thing that looks more like Remain than Brexit, then another thing that looks more like Remain than Brexit, then they call both things “Brexit.” Examples of this are: customs union; single market; both the customs and single market, plus freedom of movement and EU jurisdiction to boot (Common Market 2.0). All of these things were ruled out by the main parties’ manifestos in 2017: they were not discussed as types of Brexit during the referendum in 2016. Yet mythically they became Brexit alternatives after the general election in June 2017. When Nick Boles (Conservative, Grantham) didn’t get his Common Market 2.0 approved by Parliament on Monday, he stood to blame everything on his own party’s unwillingness to “compromise,” then he abandoned the Conservative Party (that’s the same parliamentary party that refused to kick him out when his constituency party de-selected him). Yet his fake compromise is as close to Remaining in the EU as you can get, except it would be worse, because Britain wouldn’t have any member rights. 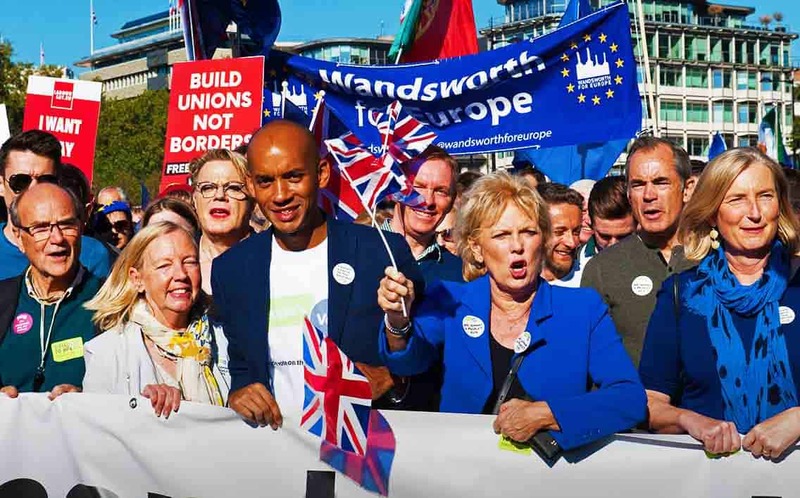 Not content to let Parliament take the credit for compromises, Theresa May is seeking her own “compromise” with the Labour Party, whose policy has been customs union with a hint of second referendum that can be hijacked by those wanting to overturn the first referendum. Put her fake deal with Labour’s fake Brexit, and you get no Brexit. They’ve been deadlocked for two days now. Neither government nor Parliament nor any of the parliamentary parties are offering the best option out of this mess: free trade, which would satisfy both Brexiteers (we leave the EU) and Remainers (we retain frictionless trade). If you can’t get a free trade agreement in time, then LEAVE the EU – that is the quickest way to end the uncertainty, start the management of change, and re-negotiate from a position of strength. Don’t believe this government’s and Parliament’s false choices. The best choices are the ones they ignore: free trade deal before we leave; or leave the EU without a deal and negotiate for free trade later from a position of strength.